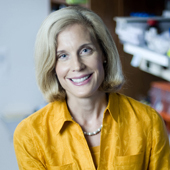 Jennifer Pietenpol, Ph.D., Executive Vice President for Research at Vanderbilt University Medical Center (VUMC) and director of Vanderbilt-Ingram Cancer Center (VICC), has been named a Chief Scientific Advisor (CSA) for the nonprofit breast cancer organization Susan G. Komen. She joins George Sledge Jr., M.D., professor of Medicine at Stanford University Medical Center, in the CSA role, including responsibility for guiding the Komen Scientific Advisory Board. The Scientific Advisory Board, whose members are global leaders in research, clinical practice and patient advocacy, helps guide Komen’s research programs and priorities. Since 2010, Pietenpol has served as a Komen Scholar, an advisory group of distinguished leaders in breast cancer research and advocacy who are chosen for their knowledge and leadership within the scientific, research and advocacy communities, and for their own contributions to breast cancer research. Pietenpol, the Benjamin F. Byrd Jr. Professor of Oncology at Vanderbilt, is a leader in molecular genetics and triple negative breast cancer (TNBC). She and her colleagues were the first to identify subtypes of TNBC and are spearheading clinical research trials to determine the best potential therapies for each subtype. “Jennifer Pietenpol is both a world-class breast cancer researcher and a proven organizational leader through her directorship of Vanderbilt’s NCI-designated Comprehensive Cancer Center. She is a superb addition to our leadership,” Sledge said. “It is a true honor to join Dr. Sledge in this co-leadership role for Komen, the world’s largest breast cancer organization which supports vitally important breast cancer research as well as programs in support of patients and families,” Pietenpol said. Since opening 35 years ago, Komen has invested in breakthrough breast cancer research spanning topics from biology to prevention, and treatment to metastasis. Komen also works in communities nationwide to serve women and men facing breast cancer, investing more than $2 billion in treatment, financial and psychosocial support programs to date. VICC is among an elite group of 47 National Cancer Institute-designated Comprehensive Cancer Centers and the only such center in Tennessee serving both adults and children. Its 300 faculty members generate more than $140 million in annual federal research funding, ranking it among the top 10 centers in the country in competitive grant support, and its clinical program sees more than 6,000 new cancer patients each year. VICC is a member of the National Comprehensive Cancer Network (NCCN), a nonprofit alliance of the world’s leading cancer centers dedicated to improving cancer care for patients everywhere.